Intersil Corporation (NASDAQ Global Select: ISIL) today announced the release of the ISL6422B and ISL6423B LNB supply and control voltage regulators. These compact and energy efficient regulators are the industry’s first to use an I2C interface to improve system reliability by reporting diagnostics and protecting a satellite set top box (SSTB) against overvoltage, overcurrent, over temperature and backward current. With a supply current of 4.0mA, a standby current of just 1.5mA, and a typical dropout voltage of 0.8V, these devices deliver superior power dissipation performance. The input voltage range of 8V to 14V also provides enhanced design flexibility, allowing designers to utilize the existing power rail in most SSTBs. The ISL6422B and ISL6423B save board space in many ways. First, the package size is smaller than competitive devices. Additionally, the 440kHz switching frequency enables the use of smaller capacitors and inductors. The devices also have internal error feedback loop compensation that eliminates the need for two capacitors and one resistor. The ISL6422B (dual output) has five current range settings up to 750mA and the ISL6423B (single output) has four current range settings up to 750mA. This enables SSTB manufacturers to design systems to their specific power budget needs. These devices feature remote device control and FLT-bar interrupt pin. Both the devices feature a built-in tone oscillator factory trimmed to 22kHz and a decoder that facilitates the use of DiSEqC 2.0 (EutelSat) protocol. An external modulation input also allows the DiSEqC modulation of an externally generated tone protocol be it the envelope or a 22kHz modulated stream. Intersil’s high-performance analog ICs provide innovative power management solutions for applications in the computing, communications, peripherals, display, networking, telecommunications, industrial, instrumentation and battery-powered products markets. 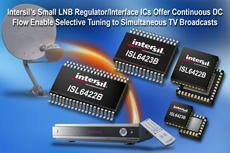 Intersil is a leading supplier of PWM controller ICs with over two billion units shipped. Intersil offers a broad portfolio of power management ICs, including single and multiple output switching regulators, integrated FET DC/DC controllers, battery management ICs, hot plug controllers and power MOSFET drivers. To learn more, visit Intersil’s Power Management page at http://www.intersil.com/power.